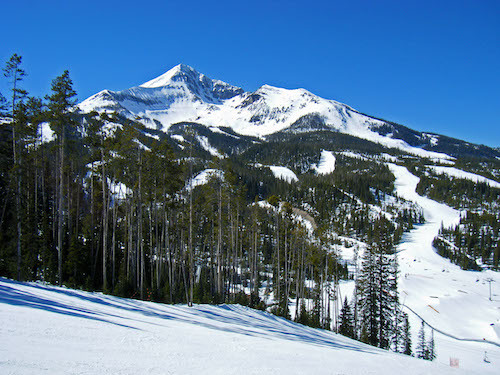 Have you ever skied in Montana? I have, and it’s amazing. We’ve had two Diva West gatherings at Big Sky (go here and here), and I’ve been there myself another time or two. The beauty of the landscape, the quality of the snow, the caliber of the terrain, all combine to create a ski experience that’s second to none. 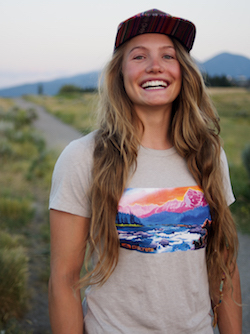 So when Montana Tourism contacted me and asked if I’d be interested in talking to Montana born-and-raised Rachel Pohl, a 24 year old skier and artist who resides in Bozeman, I said of course. Rachel is a ripping skier who finds inspiration in the Montana backcountry. Her paintings use bold colors and shapes to create exciting, fanciful representations of the landscape around her. 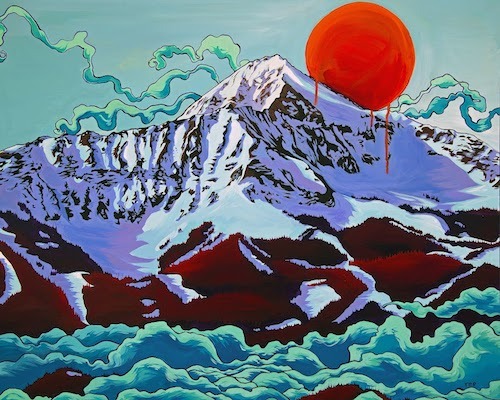 In short, she embodies the intersection of art and skiing. And the results are quite remarkable. SD: So Rachel, tell me. 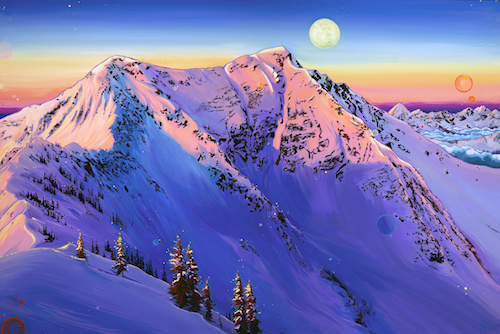 Are you a skier who paints or a painter who skis? RP: I’ve been fighting a cold and an ankle injury, so I haven’t been skiing that much this year. At the same time, this has probably been my most fulfilling season ever, because my work has been taking off and more people have been connecting with it. So I guess I’d say I’m trending toward a painter who skis. For me, right now it’s more meaningful to share my vision of the world with others, and inspire them to get outside and have their own adventures and experiences. 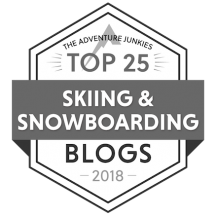 SD: Why do you think skiing and art go together so well? RP: To me, they’re each a pure expression of my appreciation for being alive. When I ski, I’m immersed in my environment, at peace, and in love with the world, with every snowflake, tree, and swath of blue sky. I have that same feeling when I paint; of feeling so dang excited to be alive that I can hardly contain myself. Also, both involve an expression of creativity on a blank canvas. Painting the places I ski brings everything full circle, although anything I paint echoes the feelings I have when I’m outside. SD: I understand that a lot of your artwork is about Montana. So what is it about Montana that you find so inspiring? RP: The landscapes I appreciate most are cliffs and rocky, craggy spires; the sort that are almost fanciful and don’t feel quite real. There’s a lot of that in Montana. We also have really unique sunsets, sunrises and alpenglow; I’ve heard a lot of people say you don’t see anything like it anywhere else. I don’t know how to describe it other than to say that color bathes the landscape in a way it doesn’t anywhere else. Plus it’s home. SD: How do you decide what to paint? And what are you trying to capture in your art? RP: I’m drawn to jagged peaks, but I think that’s also changing. I just really appreciate form and filling it in with color. I’m also drawn to certain subject matters and colors. Inevitably, I’ve have experiences where I’ve had no idea I was going to paint that thing or a place existed, and I get inspired and have to paint that. I’m trying to be a bit looser about my style but then a bit tighter about being deliberate with my subject matter. It’s such a dynamic process that I never really know. There’s no formula, and that’s what I really love. SD: I understand you live in Bozeman. I’ve been there, and it’s a very cool town. RP: Yeah, it has a great art scene, too. There’s something special about it; there’s a great focus on art and appreciation for the nuances of culture. It may be because we’re surrounded by so much ranch land and empty space. There’s room to be quiet there. You don’t have the pretentious attitude you’ll find in other places, which I really appreciate. SD: What about sking in Montana? Do you have a favorite place? What is it about skiing in Montana that makes it so special? RP: I love skiing Big Sky. I spent three years working with a mentoring program, called Big Sky Youth Empowerment there, where we ski and snowboard with “at risk” teens in the community. I haven’t done the program for a few years now, but it was a very special time in my life, devoting every Sunday to these kids (it’s an all year program actually). 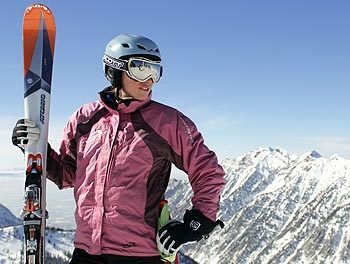 The program is flourishing and I encourage people to check it out at byep.org because I have seen first hand how skiing can change the lives of these kids. 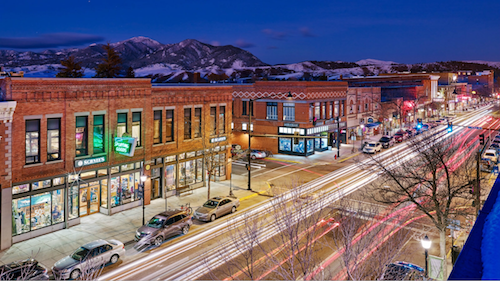 The program is completely free, mentors volunteer, and Big Sky generously donates tickets to the 80+ participants and 30+ mentors for every weekend for the entire season, every year. That makes it a pretty special place to me! I also love how unpretentious Montana is, that there are still plenty of ski areas with under $50 lift tickets where people still wear jeans and wool sweaters for outerwear. It is pretty refreshing to return to the essence of the sport, especially at little resorts in Montana. For more about Rachel and her art, take a look at the following video. PreviousHow To Get The Most Out of a Lesson.